Στο πλαίσιο της έκθεσης «TWO OF A KIND» – Czech and Slovak Visual and Graphic Artists, θα προβληθούν στην CHEAPART.HALANDRI τέσσερεις επιλεγμένες ταινίες από την Τσεχία και Σλοβακία. Προβολές: Παρασκευή 11.4, Τετάρτη 23.4, Σάββατο 3.5 και Τετάρτη 7.5.2014. Διοργάνωση της Πρεσβείας της Σλοβακικής Δημοκρατίας και της Τσεχικής Δημοκρατίας στην Αθήνα σε συνεργασία με την CHEAPART, CAMP! Sixteen-year old Mira cannot forgive her mother that after her father´s death she re-married and found happiness alongside a new husband and a child. Left-out daughter will revenge for mother´s lack of interest by her escapes from home, provocative behavior and smoking marijuana. However, her biggest trump will be to take over the mother´s husband. Mira, in her attempts for incestuous relationship with her stepfather, is plunging into a self-destructing gamble and does not realize that her desperate effort is in fact a call for mother´s love. Chamber drama takes place in a linguistically mixed area of the Southern Slovakia during an autumn weekend, on the background of fading colours, chrysanthemums and burning candles, in an impressive visual processing. “Fairy-tales are like a chain .., they go round the world and connect people from everywhere.” The film is based on the book “Fimfárum” by Jan Werich. A series of five fairy-tales, short witty moralities on human vices. Narrated by Jan Werich. Set in eastern Slovakia, Johanka lives in a small house with her strange brother and works at the local cooperative farm. 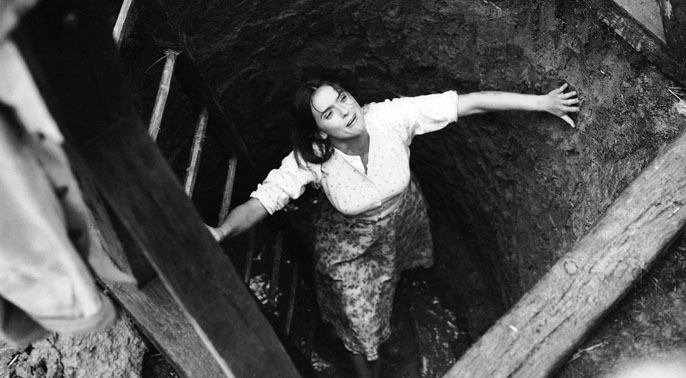 When a well-digger discovers water in their garden (a hope Johanka had given up on), her joy turns to passion for the well-digger, who leaves her pregnant. Alone, she gives birth to a daughter named Pavlínka. Dealing with the prejudices a single mother in a small village faces, Johanka strives to provide for her daughter while teaching her to avoid the mistake she made. The tragicomedy captures the mentality and uniqueness of eastern Slovakia, which has a different way of life and dialect. Directed by Štefan Uher, the film was a huge success in the former Czechoslovak state.